Real Wood. Real Value. That’s what you can expect from AdvantageLumber.com. Below you will find answers to your most pressing decking & lumber questions. If you want us to cover a topic, or if you have a question, send us a quick message and we’ll answer your question right away! 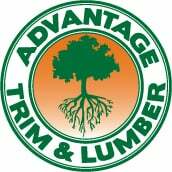 Contact Advantage Trim & Lumber today to speak with one of our expert associates. We are open Monday through Saturday and can be contacted through email or our toll free number 1.877.232.3915. How much does the deck squares cost and where can you buy them? I have a 17′-0″ x 17′-0″ Nominal Deck that will extend beyond my Garage on 1-Side with the whole Deck Cantilevered and on 6″ x 6″ Posts maybe 4′-4 1/2″ above the Ground, with a 10′-0″ Long Patio Door in a Sun Room. I will only have 1-set of Stairs going Down to Ground Level with 1-Step down to a Landing with a Side Door in my Garage Opening onto this Landing, and then 3-4 Steps down to the Ground. I have Framed this Deck using 2″ x 12″ Douglas Fir, Treated and would like to use 5-1/2″ Brazilian Walnut for my Decking with 6″ – 6-1/2″ Square Newel Posts with a Top Rail and Bottom Rail running only on 3-Sides with Metal Wrought Iron Rods for Balusters. I would like the Deck Boards to be Grooved so I can use Hidden Clips from under the Deck. I will then Apply Ipe Oil to the Deck Boards and would like to Skirt the Deck in Brazilian Hardwood just to cover the Framing. My problem is I live in Minneapolis, and would like to get this Deck built and Stained before the Temperature drops below 50-degrees, but I am having trouble finding Deck Builders who have opening time left. My local Lumber Yard is trying to sell me their Hardwood and says their Brazilian Hardwood has been Dried and will not Warp like they think yours will? My zip code is 55438- Can you Quote me Materials and Address my Concerns?? I’ll have a sales person contact you regarding your concerns and to provide you a quote. Thank you for your inquiry Tex. We live by the ocean. Can we use solid tiger wood for flooring? Will that create expansion and contraction issue? Or is engineered tiger wood work better?